Two designers and two growth hackers joined up to compete in Protohack, a non-coding hackathon. The competition began at 9:00am and ran until 8:00pm. We created the prototype, Take Ten. Take Ten was born out of a common pain point the four of us experience as busy professionals– not having the time or bandwidth to exercise. Once we had the idea for the app (11:30am), we needed to design the app for the largest audience possible, without losing the usefulness of the app. To focus and clarify our user base we developed the persona of Steve. We used Steve as a touchstone throughout the day. Steve embodies many of the same needs and behaviors, we the team experienced. 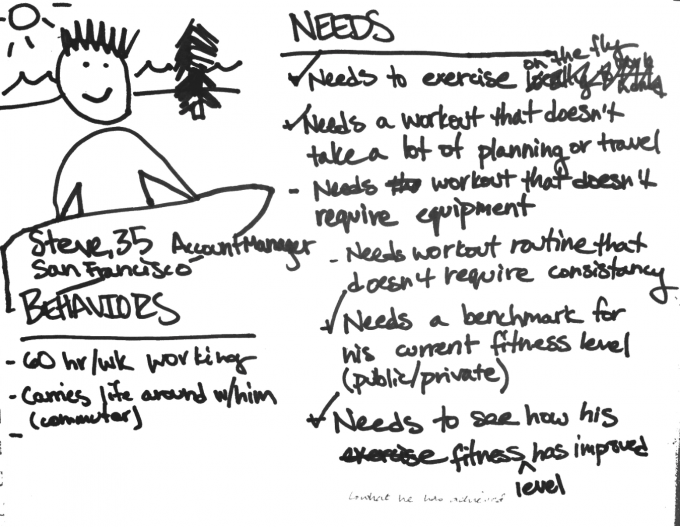 As we began sketching, we justified adding or removing features based on whether it helped Steve’s goal of quick workouts. 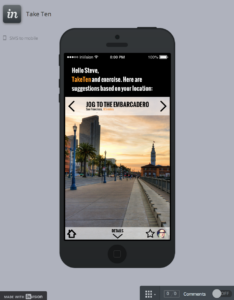 We wanted the app to be visually engaging to Steve so as he swipes through the app (his search results are displayed by geographic proximity) Steve is inspired about new local spots. In addition to the health benefits. Using a swiping interaction, Steve can quickly iterate through what is most appealing to him in the moment. We wanted Steve to be inspired to choose. Instead of that inner roar we all hear in our heads—‘Go to the gym right now. No, right now’— Take Ten returns to Steve the privilege of choice. We intentionally limited the workout lengths to ten minutes to lower the barrier for beginning the activity. Potentially, the activity could shorter if Steve sprints through those stairs that are around the corner, maybe it is more of a ‘take 5’ or if he has more time, maybe he doubles up on his Take Ten activities and ‘takes 20’. Our team was split down the middle in terms of whether we found competition a motivation for working out. We decided that understanding where we ranked compared to others in our vicinity might be that extra incentive that would allow us to transform a leisurely stroll into a brisk walk. Creating a UI with a very simple Leaderboard, Steve could either make his scores public or he could keep them private and compete against his own best time over a number of activity repetitions. In the last segment of the day, I was primarily focused on pushing out UI images, while Sheba Najmi prepared the one minute verbal presentation, ￼￼and Scott Hutter and Lyle McKeany searched for high-quality assets. Once the Pixelmator files were complete, Lyle added the iPhone interactive ￼simulations using Invision. By 8:00pm all projects were submitted, and competitors had one minutes to demo their app. Criteria: Does the application flow well, is it intuitive and easy to use? Judge’s Feedback: Great presentation, good flow/ui. Super simple, like the leaderboard aspect. Criteria: How well does the team communicate their idea? Did they stay within the 60 second time frame? Judge’s Feedback: Good pitch, once looking. Criteria: Is the solution novel? Does it solve a problem in a creative or never-seen-before way? Somewhat saturated market, worried about monetization. Judge’s Feedback: Basically mapmyfitness, so low innovation feel but pretty good. Criteria: Would the application have real social impact? Can it change the world, or at least help someone? Does it solve a real problem? Judge’s Feedback: Cool Idea. Strong community of people that would adopt such a product. Very viral because people are enthusiastic about the results they achieve.